Nice picture by Kazik/Anadune from the demo “The Sunrise”. It is unrelated to the post below, but looks so cool that I felt the need to include it nonetheless. Ever wanted to get a bit of the “feeling” of the AmigaOS 4.x, but don’t know where to try it? Then you’ll be happy to know that a guy by the name Michael Rupp has made an Amiga Workbench Simulation – and it’s Online! Did you enjoy it? 🙂 I don’t know what plans the author has for the simulation yet, but it certainly has some potential when it comes to marketing AmigaOS. And do you like the picture at the top of this post? 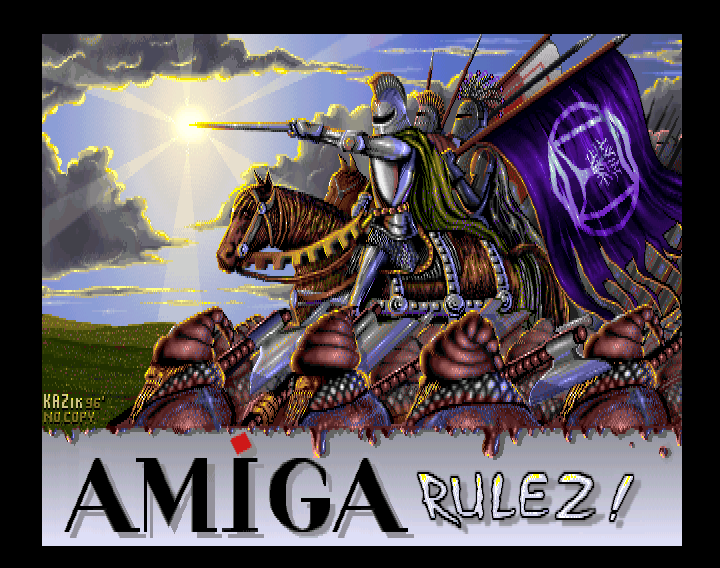 Great Amiga-art from the Polish artist Kazik. Good to see TAWS is being actively developed. Cool looking stuff. The KAZik’s artwork is amazing. Reminds the best days of Amiga, when I use to write “Amiga rulez!” everywhere too 🙂 Good times. Good times, indeed! 🙂 Many good artists back then.. Lazur, Kazik, Mustafa, Dzordan, Pix.. and several others!